A collaboration between Amerec and world-renowned designer Ristomatti Ratia, the SAUNATONTTU is the ultimate sauna heater. Incorporating several patented features and superb European design, SAUNATONTTU is truly the “best sauna heater in the world”, bar none. Its secret is in the constant heat retention by the large quantity of rocks within the super-insulated shell. This means soft, perfect heat is always available, letting you enjoy a sauna without preheating. 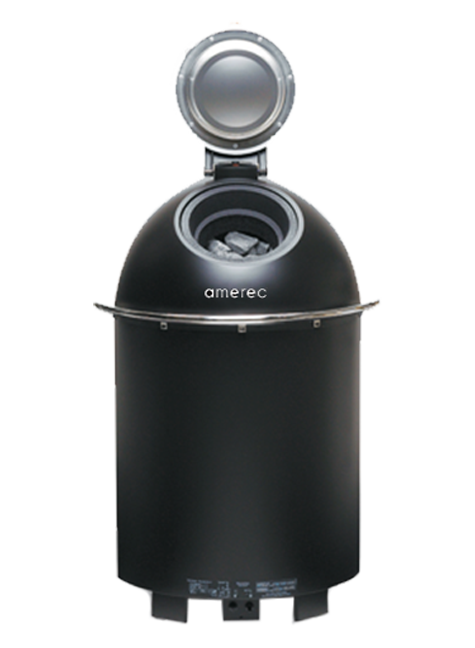 Low 300 W standby power, 200lb rock capacity and unique black insulation shell ensure genuine sauna heat quality is stored and available as you want it. Patented insulation system is cool on the outside, minimizing safety distances and giving you more freedom in layout design. Compact (size 19 3 /4” x 43” x 19 3 /4“) yet high capacity and output. Part of the famous RATIA collection — professional world-class design with the latest sauna heating innovations and functions. Can be mounted free-standing or sunk into the floor or bench of your sauna. Easy to clean and maintain, guaranteed for years of trouble-free performance.